This July, Whitney Art Works presents "Arc of Visibility: Between the Shore and the Sea: works by Wendy Prellwitz and Michael Torlen. 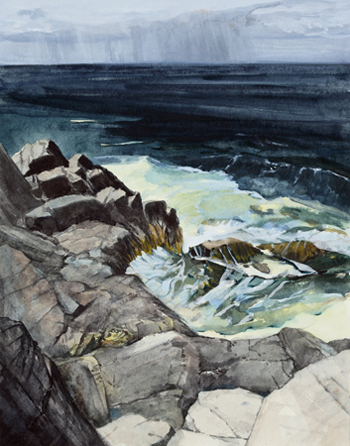 The paintings and monotypes on display by Wendy Prellwitz reflect the artist's attachment to Monhegan Island and Ireland and a lifetime of gazing out over rocks and water. In her own words, "Monhegan is a special place, giving my life continuity and inspiration, finding familiar rocks, seeing something new …and just being there. The western coast of Ireland, in County Mayo is another special place. 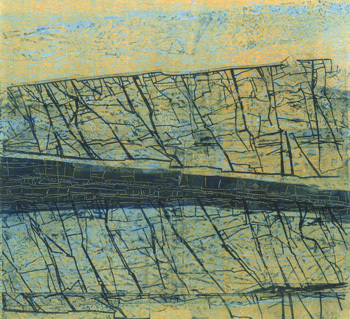 The rolling boglands and massive sky - with churning clouds or glowing mist - has intensified my study of the rock patterns by the edge of the sea and also pulled my focus up and out over the coastal landscape. Like Monhegan, there is an isolation in Mayo and a beautiful austerity, with nothing in between the landscape and oneself. I have found that experience to be intense and profound. I have continued to paint water over the years, still captivated by luminous coastal situations- the drift of the sea and atmosphere in diffuse morning light, the glow of moonlight - and am still connected to the enormity of space, and the sense of an expansive place beyond, like a fascinating infinity that pulls one outside of oneself." Michael Torlen’s ongoing series Songs for My Father, is a body of over 1,000 landscape works inspired by his interest in the Maine coast, the sea, National Parks and the northern romantic tradition. The watercolors at Whitney Art Works from this series were painted in 2007, in the open air on Monhegan Island, near Lobster Cove. Each work was executed in transparent watercolor and opaque gouache on a different colored paper, affording a unique appearance to the “reserved” paper areas. Also on view are selections from a narrative series Sanger Fra Mor (Songs From Mother). This work is a critical visual essay using commercial fishing, oral history, and autobiographic images to focus on fishing, the ocean, and the environmental crisis. He draws upon his experiences both as a young boy aboard ship with his father and as a crewmember on a commercial tuna boat. Of note: Michael Torlen will be teaching a watercolor workshop, the English Method, in July 2008 at MECA, continuing studies program, in Portland, Maine. Contact Cheslye Ventimiglia at MECA, continuing studies program, 207.873.5742 ext. 760, for more information and registration. 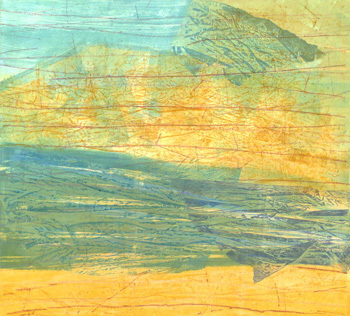 Arc of Visibility: Between the Shore and the Sea by Wendy Prellwitz and Michael Torlen will be on display from July 2 through July 26, with an opening reception on July 4 from 5-8pm.